ValleyBiz Story | Submitted photos. Colour is an important part of our world. It can impact our emotions and our state of mind. Colour is often one the first considerations in our home improvement projects. So, what if colour could be used to help improve the lives of dementia patients? Cindy Woodson, Care Team Manager for Swan Valley’s Long Term Care (LTC) Facilities in Swan River and Benito believes it can. Woodson is heading up “Our Home Improvement” Project, a project to improve the environment for residents in the three Swan Valley LTC facilities, with a particular focus on creating a dementia friendly environment. “The focus will be on paint colours, wall murals and tactile components to stimulate memory, keep people busy, diminish exit seeking and reduce aggression.” said Woodson. “Studies on the implementation of similar initiatives have shown reduction in infection rates, aggression, psychotropic medication and fall rates, along with an improvement staff morale.” she added. 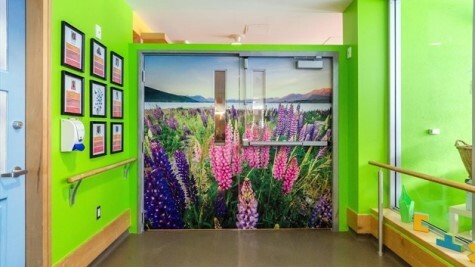 Sample: Wall murals can define spaces and create interest. There is a growing movement among LTC facilities to move away from clinical, generic settings in favor of a more personalized, home like environment. 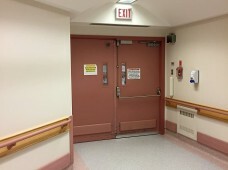 For example, decorating doors with different paint colours or unique designs can makes resident’s rooms, bathrooms and other areas more recognizable thereby reducing confusion and anxiety. Word art on residents doors provides care givers with information about the resident’s interests leading to more meaningful interactions. Hallways decorated with bright paint colors and wall murals help define spaces, break up monotony and create an interesting and stimulating environment. 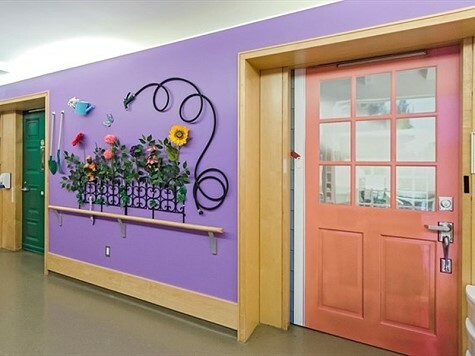 Using highly contrasting colours on floors, walls and furnishings can reduce fall rates in patients with decreased depth perception and vision loss. 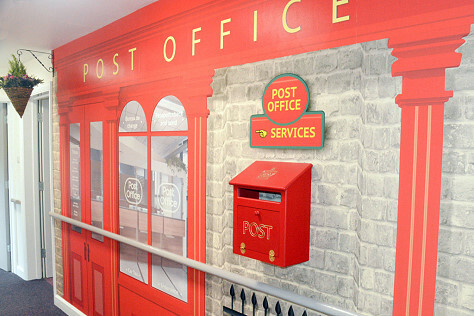 Murals create interest and can be used to deter exit seeking by disguising doors to look like bookshelves, fences or other barriers. An inviting and relaxing theme along with high contrast table settings can create a more positive meal experience to help increase meal times and improve appetite. A more flexible meal schedule can ensure food is available when residents feel hungry. These changes can help combat challenges in nutrition that can occur as a result of loss of interest in meal time. 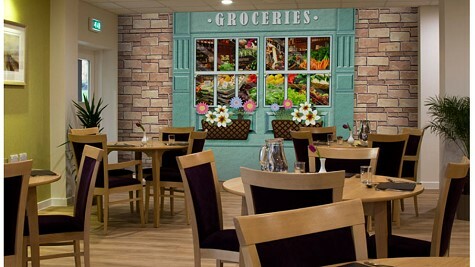 Sample wall mural in dining area. According to Woodson, the project has had a positive reaction from staff and, when given the opportunity, many were excited to be involved in the planning by adopting a hallway or other area to transform.